I have always been fascinated by language. I’m naturally drawn to communication, especially in the form of books, poems, songs and letters. To me, language takes its most beautiful shape in the form of written language. I find myself drawn to writing thoughts down many times over and shaping them until they become poems, with a life all their own. The pull of connecting with people through my writing keeps me coming back to it. There are multiple ways a single poem, however long or short, can be interpreted. No matter how I express a thought or idea it can always mean something entirely different to someone else. This is what creativity and arts are all about. Yesterday I was honored and privileged to be the guest of Indian Consul General Hon. 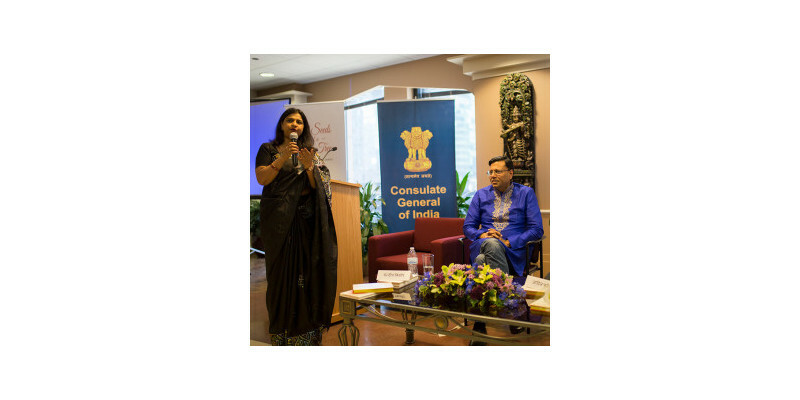 Neeta Bhushan ji at the Indian Consulate in Chicago at my book reading event. 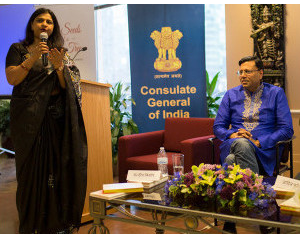 I read poems from my books and participated in a panel discussion on the preservation of Hindi, Sanskrit, Urdu and Bangla, all put together by the Consulate and Hindi Lovers Club. What an amazing display of love of culture! It’s wonderful to witness others openly embracing US culture while lovingly tending to Indian languages and culture. It may seem as though the two could not co-exist, but they do, and I saw it done with grace. It’s always a delight to read poems to an engaged audience and my special thanks to all who attended the event at CGI Chicago. The audience was exceptionally attentive and appreciative of the reading from my second book, Old Seeds of a New Tree. It’s always amazing to see the liveliness and energy of Indian diaspora and I think poems connect everyone. They relate to us one-on-one and take us all into our own journey of thoughts and ideas, love and affection, pain and growing up, success and determination. I was deeply touched by meeting with all, with their comments and more importantly how they felt being a part of the poems. My contributions on the importance of preserving Hindi language are from a deep place. Hindi is pervasive in all my childhood memories — it’s my native language. My entire schooling, till I got to IIT Bombay, was at a Hindi medium school in Patna, Bihar. It is a key part of my foundation. The feeling was mutual for Professor Mandira Bhaduri of the University of Chicago and her relationship with Bangla. And it is understandable that the other two panelists, Mr. Adil Farid and Dr. Ganesh Visvabharathy, felt the same about Urdu and Sanskrit, respectively. Language is so deeply embedded in us that it comes as close to defining us as anything can. It even gives us a sense of purpose and self. At book readings, I am often asked which is my favorite poem that I have written. I love all my poems! Some days I relate more to the poems of aspirational hopes and dreams. Some days other poems help me to stay pensive and quiet. It is often the mood of a poem that sticks with me. Language is the tool that creates the mood for readers. It’s not always easy to translate perfectly from Hindi to English. This was a challenge for me when I wrote these poems in Hindi and wanted them to translate into English. I had to find a way to translate my poems from Hindi to English without losing the nuances and feelings. A poem is more about meaning than actual words, so I made a decision to translate more loosely to retain the original meaning. English clearly is an acquired language for me and I have tried my best to do the translation keeping the sentiments and flow intact. Today’s event was also about language, but I see it as more than that. To fully celebrate language is to celebrate heritage and culture. Many intelligent discussions broke down the logical reasons for sustaining these languages, but emotional reasons were valid and just as strong. I have been fortunate enough to live in the worlds of business and creativity — different but complementary. They each give meaning and purpose to what I do. Two worlds can co-exist: the ancient language of Sanskrit in Hinduism and modern Sanskrit literature are an example. We don’t have to close the door on heritage to open the door to the future. Heritage and culture run deep. None are perfect but they are ours and give us a sense of identity and geographic place in the world. If we are responsible with our ideals, we can celebrate these both for a long time to come. Back on my flight again after the event yesterday, I will no doubt be drawn in again by an idea, a feeling or thought. The tactile act of writing somehow taps into my mind in a more meaningful way. Once again I’ll follow that creative compulsion and be glad I did. By honoring these creative moments, I’m honoring my passion for language and poems. I hope you do too.